Sleep is essential for children’s physical and mental health. While children sleep, their minds and bodies are busy replenishing cells, restoring energy and rebuilding tissue. Getting too little sleep make children cranky and, with time, unhealthy. Poor sleep in children (but also adults) leads to long-term health impact such as heightened risk factor for diabetes, high blood pressure, decreased immune function, major depression, obesity etc. In addition, studies show that children who don’t get enough sleep can end up with behavioral and learning problems that persist for years and affect a child’s life forever. Babies, children, and teens need significantly more sleep than adults to support their rapid mental and physical development. However, many parents don’t know just how many hours of sleep their kids require. Typically, newborns need between 11 to 19 hours of sleep. Infants between 10 and 18, toddlers between 9 and 16 and preschoolers between 8 to 14 hours of sleep. School-aged children need not less than 7 hours, but not more than 12 hours of healthy sleep. But what is required for a healthy sleep? In short, healthy sleep includes a sufficient amount of sleep, uninterrupted (good quality) sleep, proper number of age-appropriate naps and a sleep schedule that is in sync with the child’s natural biological rhythms (internal clock or circadian rhythm). Since securing better sleep for kids is a priority for every parent, below are a few tips to help you improve your child’s sleep. Routines are especially important for infants, toddlers and preschoolers. Keeping regular sleeping hours and sticking to the same sleep schedule every night helps your child’s body to find its natural rhythm and settle into a regular sleep-wake cycle. Set the sleeping schedule according to what best suits your child and your family in general. The key is to be consistent (yes, even if you are on a vacation). Soon your child will adapt and sleeping will become one of the anticipated activities. A natural bedtime for most infants, toddlers, and preschoolers is earlier in the evening between 6:30 p.m. and 8:30 p.m.
Another important thing is the transition from wake time to sleep time. Engaging children in relaxing activities and specific things before bed, such as taking a warm bath or story time, signal to your child what’s coming next. Knowing what comes next is comforting and relaxing for both, babies and kids. Turn off the TV and avoid screen-time at least an hour before bed. Studies have shown that the light from a television screen, phone, or computer monitor can interfere with the production of the hormone melatonin. This hormone is an important piece of sleep-wake cycles. When melatonin levels are at their highest, most people are sleepy and ready for bed. Having a regular sleep schedule helps to ensure better quality and consistent sleep. Be consistent in waking up your child around the same time each day, even on weekends and vacations. This programs the child’s brain and internal body clock to get used to a set routine. Children who wake up around the same time in the morning are more likely to nap at predictable times and feel sleepy at their bedtime. Here again, consistency is the key. So, keep wake-up time the same, within and hour or so, every day. A natural wake time is earlier in the morning between 6:00 a.m. and 8:00 a.m. Since your child can develop health issues if he/she does not get the proper support while sleep, make sure you invest in a comfortable mattress and pillows. In addition, choose cotton sheets and pillowcases that feel good on your child’s skin. This material is soft and absorb moisture, allowing the body to stay warm in cold weather and cool in warm weather. Make sure your child is not too hot or cold in bed. For both children and babies, a safe sleeping environment is between 18 and 22 degrees. In addition, check if there are noises that might keep them up. If your child is extra sensitive to noise, a fan or white noise machine may help. 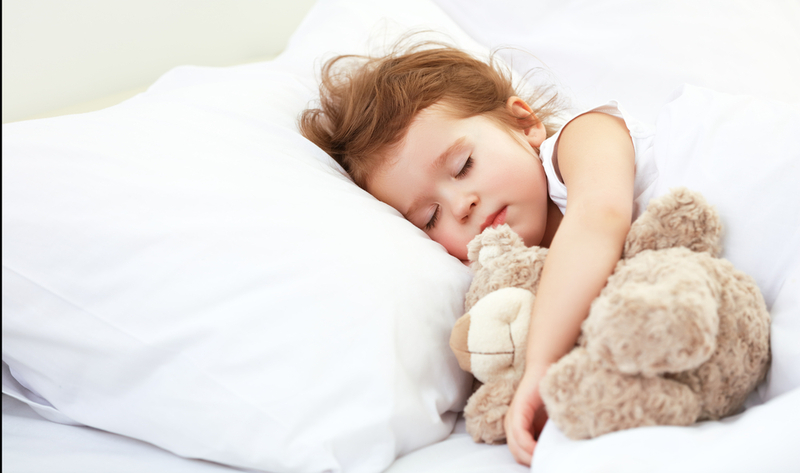 Help your child settle for sleep with a sleep environment that is quiet and dimly lit. Blue/white light is a stimulant that actually boosts attention and reaction times. These are not benefits that you want for your child as you are settling him/her to sleep. Total darkness at bedtime is best for sleep. However, if you insist for a source of light in your child’s room, try opening the window blinds or, if you must have an artificial source of light, the best color for night lights is red or orange. As a parent, your role is to provide healthy food in appropriate portions, and your child’s role is to decide how much to eat. The most crucial first step to getting on schedule and getting your child (especially babies) sleeping restfully through the night is ensuring that he/she is taking consistent feeds during the day. In addition, make sure your child has a satisfying evening meal at a reasonable time. Feeling hungry or too full before bed can make your child more alert or uncomfortable. This can make it harder for him/her to get to sleep. In the morning, a healthy breakfast helps to kick-start your child’s body clock at the right time. According to the American Medical Association, children should get at least 60 minutes of moderate-intensity physical activity per day. Exercising brings many benefits for children such as lower rates of obesity and higher test scores in reading and math. It also promotes self-efficacy with regard to health and self-image, decreases symptoms of depression and anxiety in children and also helps them sleep better at night. Running around, jumping and playing sports is great energy outlet. Make sure your kids have interesting and varied activities during the day. Getting fresh air has physical health benefits for children. Kids who are outside are more likely to get their daily dosage of vitamin D, which assists in bone strength and lowers risks of cancer.